The track at the venue is one of the best batting tracks in New Zealand. The three-match ODI series between New Zealand and Bangladesh is scheduled to get underway tomorrow. The opening match would be played at the McLean Park in Napier and the visitors would be going into the contest without their stalwart Shakib Al Hasan, who has been ruled out. They also don’t have the in-form Taskin Ahmed after the speedster injured his ankle in the Bangladesh Premier League (BPL). Moreover, the Tigers are yet to beat the Black Caps in New Zealand and are required to pull out something special to turn the tables on the hosts. The home team, on the contrary, lost the ODI series to India 1-4 and wouldn’t want to suffer another hiccup against Mashrafe Mortaza and Co. Bangladesh and the Kiwis last met in the 2017 Champions Trophy in England, where the former won in the humdinger. The first game of the 3-match ODI series between New Zealand and Bangladesh will be hosted by the McLean Park in Napier. The match starts at 2:00 PM local time (1:00 AM GMT) (6:30 AM IST). The game will be live on Star Sports 1, Star Sports 1 HD in India. (Live streaming in Hotstar). New Zealand: L, W, L, L, L.
The track at the venue is one of the best batting tracks in New Zealand because of the short square boundaries. 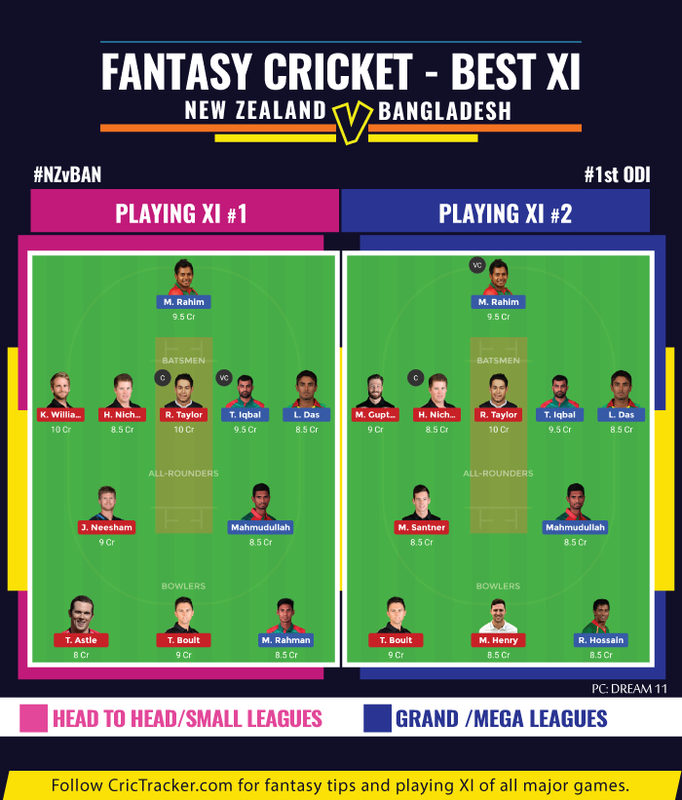 Martin Guptill, Henry Nicholls, Kane Williamson (C), Ross Taylor, Tom Latham, Jimmy Neesham, Colin de Grandhomme, Mitchell Santner, Todd Astle, Matt Henry, Trent Boult. Tamim Iqbal, Liton Das, Soumya Sarkar, Mushfiqur Rahim (WK), Mohammad Mithun, Mahmudullah, Sabbir Rahman/Mohammad Saifuddin, Rubel Hossain, Mehidy Hasan Miraz, Mashrafe Mortaza (C), Mustafizur Rahman. Going by the recent BPL form, Mushfiqur Rahim has to be picked ahead of Tom Latham among wicket-keepers.